It’s no secret that I’m a huge fan of edible wedding favors. Cookies are fun, candy buffets where guests can fill fun boxes full of sweets are even better. But today’s fun wedding favor takes the cake. I give you Personalized Popcorn Pails! 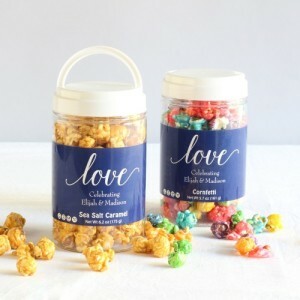 These sweet treats are fun plastic pails filled with four cups of flavored popcorn (options are Sea Salt Caramel or Confetti). Then you can choose a personalized label for the pails and your guests will get a super sweet snack to take home! 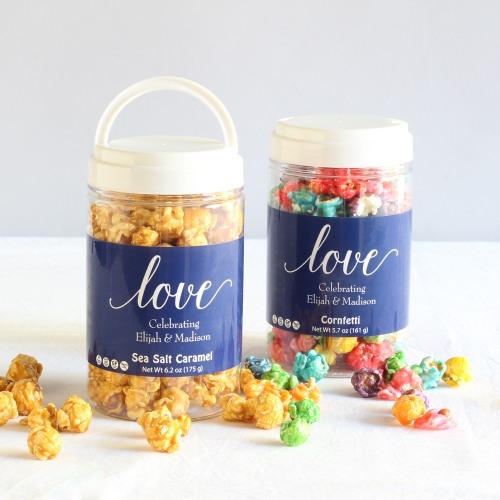 The popcorn pails would be great for a destination wedding – you could have the pails in guests’ welcome bags so they can nosh on it in their hotel rooms. Or, you could add the pails to a dessert buffet! You’ll find these fun popcorn pails here.